This blog is dedicated to all Java developers. I'm trying to present my everyday problems I encounter developing complicated systems and my solutions to these problems. Java EE topics are also covered (JMS, JAAS, JCE, TIBCO EMS, Tomcat, etc.) This blog extends it's subject range also to Agile Software Development frameworks like Scrum and XP (eXtreme Programming). 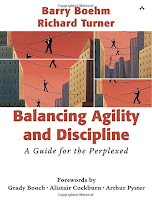 I was quite disappointed with this book especially when I read that agile development means lack of discipline (how about unit testing, pair programming, continuous integration, etc.) 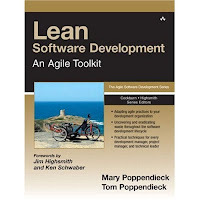 This book tries to give managers tool for deciding which methodology (waterfall/spiral/RUP or agile) is better to which kind of projects - the variables are criticality of the project (how many lives depend on this software), number of people developing this software and probably time (probably because I don't remember exactly). Anyway - I'm giving this book 3/5. Excellent, brilliant, great book! 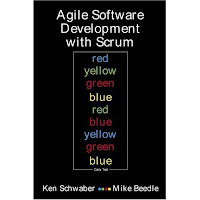 This book is the best book written by Ken Schwaber about Scrum. It gives theoretical fundamentals for Scrum and answers the question "Why Scrum works better that waterfall for software projects?". If you use Scrum this book is absolute MUST for you. my score: 5/5. This book gives project leaders seven agile tools that will make your team work better. 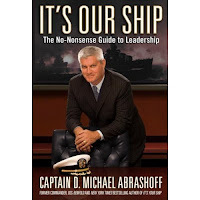 Authors take as many ideas from Toyota lean methods as possible and they show why they work. After reading this book you can understand why old methodologies like waterfall doesn't work and why agile methods like Scrum works. Absolute MUST for agilists. Score: 5/5. I will tell you one thing: the first book was much better. Although some thoughts in this book are really great, it is generally boring. And it's quite strange because I read the first book in couple of hours and I was fascinated. Maybe it's too similar, maybe author focuses too much on his American roots and American culture (too many "we are Americans and we do it like this and that"). Well, maybe this book is for Americans only. I'm giving this book 3.5/5 but only because I like the author and his previous book. java.util.Calendar confusion - is it safe or not? Is everything OK for you? How issue tracking systems fit agile development?